I have a confession, you guys. It might just expel me from the Society of All Women Aged 18-35, but I just can't go on pretending anymore. I have to come clean. I don't really like Starbucks' Pumpkin Spice Lattes. 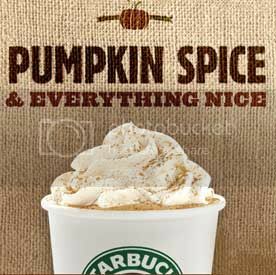 I like other pumpkin-flavored things--even other coffee shops' pumpkin-flavored lattes. Just not Starbucks'. It tastes weird, guys. It has a funny aftertaste and the truth is I don't care for it at all. Whatever syrup they use doesn't taste like pumpkin. Plus it's actually orange, which kind of weirds me out. I have tried, season after season, to like these things. Every fall I enter with renewed enthusiasm, hoping that I'm just remembering wrong or the baristas messed it up the last couple times I tried. This time will be different, I tell myself. On its face, it should work. Espresso? Good. Pumpkin-cinnamon flavor? Good. Skim milk? Good. But no. It's always the same. I just sip it down bit by bit, trying to justify it and tell myself I am enjoying it, but I eventually give up halfway through and throw it away. And I have come to the conclusion that I like the idea of Starbucks' pumpkin spice lattes much more than I actually like the latte itself. I'm just trying desperately to fit in with the rest of women my age who are obsessed with it so I can tweet about it later, and that's no way to live, right? So I am vowing, right here and now, no matter HOW much I am tempted to, no matter how much I want to be a part of the PSL Club, no matter how much I think things might have changed and I might like it now, I will not order another PSL from Starbucks. No more. Because I end up wasting $4 and a perfectly good coffee experience, when I could have just stuck with the ol' faithful vanilla latte and been much happier, and not had to live with an intense feeling of buyer's remorse. So, fellow women and everyone on social media ever, reject me if you must, but I just can't keep doing this. I love coffee, and I am ruining it for myself. If we go to Starbucks together, I will get a vanilla latte. Or I will contemplate a pumpkin latte and you will say (because you're such a good friend), "hey, remember, you don't actually LIKE those. You just want to like them." And I will thank you for your kind reminder and go back to the vanilla latte that rarely disappoints, unless the barista is terrible at their job. Tell the truth: do you like PSL's? Am I just crazy or are there others like me out there?